I am a French developer, used to the French keyboard layout. Being a developer, I invested recently in an Apple international keyboard. Having a french keyboard, typing in the tilde '~' character was quite simple since it was printed on a key as far as I remember, although I don't remember where. Now with my new International keyboard, the layout is very different, missing accents and other special character (which is ok since I use that keyboard only for development on my mac) but I am facing the issue that I need to type in the tilde character very often, and I don't have any clue on how to type it in in a simple way. The "~" key is located between the "left shift" and "Z" keys on the international english keyboard. Many users are used to have this key under the escape key (the US layout), and they (including me) use the KeyRemap4MacBook software to swap those keys. 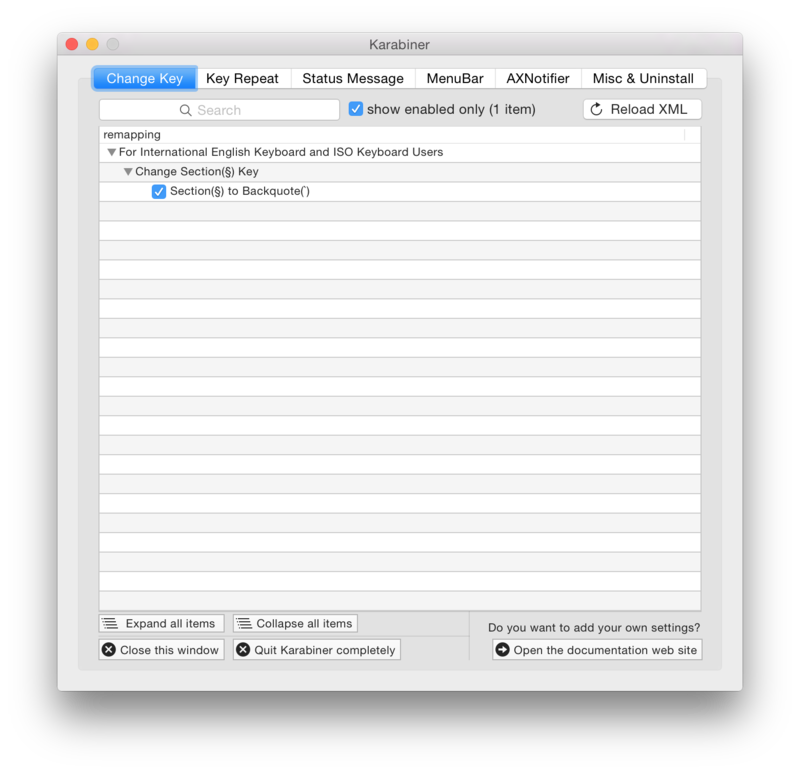 Edit: KeyRemap4MacBook is now called Karabiner. 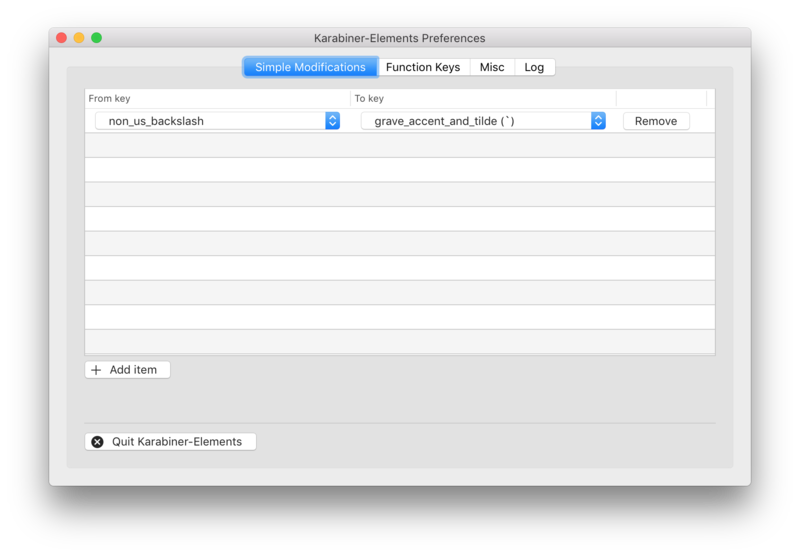 Here is a screenshot of the configuration I'm using to remap Section to Backquote key. Option N -> space You actually type ã or ñ but on a space. Hope it helps. Shift Alt-R & then E gives É etc. ` then A gives À etc. Alt-R N then A gives Ã etc. AltGr + 4 twice ~~ in Windows XP. Not the answer you're looking for? Browse other questions tagged macos keyboard character . 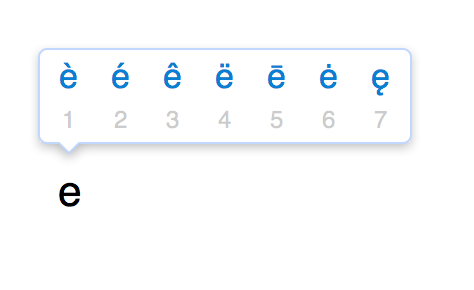 How to type this tilde ~ in Mac (I can only type ˜ Using Fn + N) on an Italian Mac? What is the best way to modify Apple keyboards for alternate layouts? Dvorak keyboard layout with international character support? How can you customize the keyboard layout / shortcuts? How do I type + (plus) character on a Swedish Apple Wireless Keyboard using US keyboard layout? How can i change and customize the special characters on my keyboard? Weird US keyboard input on Macbook Pro with French keyboard layout? What is the purpose of the §/± key on a UK Mac keyboard? How do I disable context menu key from Windows Keyboard?